C16 H28 O is the formula of the Ambrox, one and only ingredient that make this new fragrance. Ambrox is born in the 50's by Firmenich to replace grey amber too expensive to use it often. Ambrox is use, in general, as base note... for "Not a perfume", it's the lead role! 1. As noted in the quote, ambrox is a synthetic substitute for ambergris. Escentric Molecules' Molecule 02 was likewise just a bottle of Ambroxan. Soooo… what does Ambroxan smell like guys? Is this a trend now? Releasing single molecules as perfumes? This is to perfume what Warhol was to soup cans. At least the Andy Warhol painting is worth something, even if you don’t get any soup out of the deal. It’s not a super-new idea. Helmut Lang did Velviona almost a decade ago, and that was nothing but bottled Velvione (a synthetic musk), and his Cuiron was hardly anything except synthetic leathers. And then there are the two Escentrics, Molecule 01 (which was just Iso E Super, a sort of creamy sandalwood synthetic) and Molecule 02, which Robin has mentioned. I believe Luca Turin said someone should bottle pure hawthorn extract, diluted of course, because it smells so good all by itself. Believe that was hay….? But would love to smell hawthorn, too! You are correct– it was hay absolute. Hmm. Wonder how much it costs withOUT the fancy packaging? Can the masses just order it from Firmenich? This seems completely pointless. Then again, I never was an “art” person. It made a little more sense with Escentric Molecules because they were pairing it with a “real” scent based on Ambroxan. This seems like “a provocating declaration which doesn’t follow modern perfumery rules” because modern perfumery rules would seem to indicate that you get an actual finished product for your money. …sounds to me like they just didn’t want to pay a perfumer to make a new fragrance for them. Let’s just dilute and pour into our great bottles! What a concept. If I want plain old amber, I’ll just go to the hippie oil shop. I like their other fragrances, but this idea is ridiculous for the price point. Another silly gimmick, almost seems like releasing for the sake of releasing. At least it makes it easier to decide which new things to smell and which not to even bother with which is handy when there are more and more new releases every year. So true. Just checked, it is actually a bit cheaper than the Escentric Molecules 02, although I suppose the price may change if/when it is released in the US. Worth checking if you insist on buying such a thing. And, how much are they charging for this unique little nothing of a fragrance? I wouldn’t go next door for it, lol! But I do love Lady Vengeance. I wore it yesterday. Apparently they eliminated the translator’s budget, too. 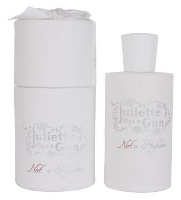 I read this as “Juliet has a gun, not a perfume.” My brain works in strange and useless ways. hey me too….so I guess I second the strange and useless brain thing. I’ve liked the JHaG line….I feel kind of disappointed in them for “pulling a stunt” like this. Besides, aren’t all their scents supposed to have something to do with Rose? I have to go comfort my bottle of Citizen Queen now, to assure her that her family’s shame is in no way her fault…. Maybe this is the family member that gets locked away in the attic, and no one ever speaks of them. shhhhh! we promised we wouldn’t speak of them….. I did too, maybe a common neuronal defect? isn’t that Escentric Molecules Molecule 02? You can get Ambroxan crystals from The Perfumer’s Apprentice for a mere $5 and concoct your own solichem. Maybe no one else has thought of it and I can patent it and make millions. Oh. My. Word. As a former English professor (now a dean) and someone who’s closest friend is a chemistry professor, may I just say, on behalf of the learned – OUCH! There’s so much wrong with that copy that three or four more “sics” wouldn’t even be enough. I’m afraid that I’ll save my perfume budget for, well, perfume. Well THIS is embarassing…um, that should be “…whose closest friend…” Ooops. Serves me right for being snarky. I call it “premature fingerlation” ( I should coin that). We sometimes are so hell-bent to type out our comments that we push “Send” immediately afterward, and usually regret it because there is always something that is incorrect. “Premature fingerlation!” I am laughing so hard I might pee my pants! This being said, I am sure that Juliette Has a Gun must be making at least $80.00 (before VAT)on every bottle of this sold….I somehow doubt they are using 25%, thought I have been, and in this case, too, could be wrong. If it smells really good, it doesn’t necessarily bother me. Well… maybe a little, considering the profit margin. I may do a little “solichem” experimenting with Perfumer’s Apprentice materials myself. This is pretty condescending stuff, especially at those prices. WELL. Y’all probably know I love me some Citizen Queen, but if it’s Not a Perfume, I’m Not Opening My Wallet. Poor English language. You deserved better. I like the name, especially when you read it with the comma Miss Kitty and Daisy both inserted. That’s about all, though. At least Uncle Serge mixed some ingredients together to get his ‘anti-perfume’. Mind you, I suppose there might be a lot of skill involved in diluting. Drop by careful drop kind of thing? I wonder if this is the woody amber note that kills me in Citizen Queen. There’s some woody amber material in CQ, Coromandel, and Musc Ravageur that I am hyper-sensitive to, it’s all I can smell and it smells like a staple gun the frontal lobe. However, I know there are scents that contain Ambroxan that don’t bother me (Andy Tauer uses it) so it must be a dosage issue. No way I’d risk it by buying this, of course. Attention: I would like to announce the launch of my new anti-perfume: No Scent HOH. It consists of ultra-pure hydroxylic acid, a naturally occurring molecule which plays a crucial role in a multitude of life functions for the human body–in fact, for every known living species on earth. This colorless, tasteless, but essential substance, is purified to 99.99%+ purity, then bottled in lightweight, transparent, ergonomically designed, “splash” bottles. No Scent HOH, when applied liberally to the body, produces a delightful sensation of coolness and freshness. It possesses a very light, refreshing scent. It is so pure and natural, in fact, that it may even be taken internally without causing any harm. It is available in 500 ml and 1000 ml sizes for $100 and $175, respectively. H2O. LOL. I wish I had noticed this when the original post went up! How boring of them. The emperor is naked, and seems kind of underendowed. I know everyone thinks this kind of thing is uber gimmicky (see also Escentric’s stuff) but if it works and you like it, who cares? I love and wear Escentric 01 almost exclusively, it just works well on me. I know I should feel like I am getting ripped off, or that I could buy the straight whatever it is from somewhere, but I like the packaging, the few notes blended in, how it lasts, etc. etc. Surely anything is gimmicky if you look at it from the right angle these days. I’m more offended by the boatloads of mediocre fruity floral gourmands out there! Don’t mean to argue, but Escentric 01 is a “finished” perfume…it has other notes as well, so to me that is not a rip off. It’s a great scent and I probably would have bought it if it wasn’t so similar to something I already owned. And to me, it made at least some sense to release Molecule 01 at the same time — was interesting to compare the 2. This one just seems sort of silly, although I do know what you mean by the boatloads of mediocre scents out there…. What did you think Escentric 01 was similar to? Ormonde Jayne Isfarkand. They are VERY similar. LOl….. not all perfumes have to be screaming when entering a room. I bet this one won’t be all bad, especially if its a little like Escentric Molecules, which has a large following. Its definitely worth a try. Harvey Nichols London and Selfridges Oford Street are the only two places I could find them :/ but I bet there are more places. Selfridges has Miss Charming, Lady Vengeance, Citizen Queen, Calamity J, Citizen Queen and Not a perfume available online all is not lost, I want to try them all, they do the complete collection of Juliette Has A Gun in a set of 6ml vials of 2ml €6.90 that’s well good. at looking at some of the bottles on Selfridges, they’re pretty expensive. midnight ode is £98 for 100ml. and speaking of midnight ode, I don’t really go for perfume with the words “night” in it because the OCD in me would only allow me to wear it at night, like for going out. Just got a decant. Cloying. No more a perfume than a bassoon is an orchestra. It is nostalgic tho, reminds me of the smell of my mom’s scarf drawer, something I associated with lady-like and grown-up. All in one blast, tho, it’s too much. I can even taste it! Maybe OK to layer with an actual perfume.